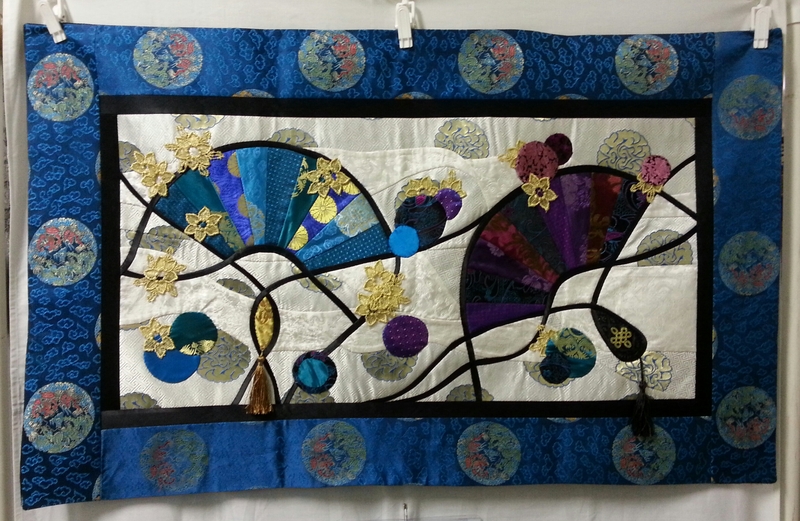 Greetings for the New Year! 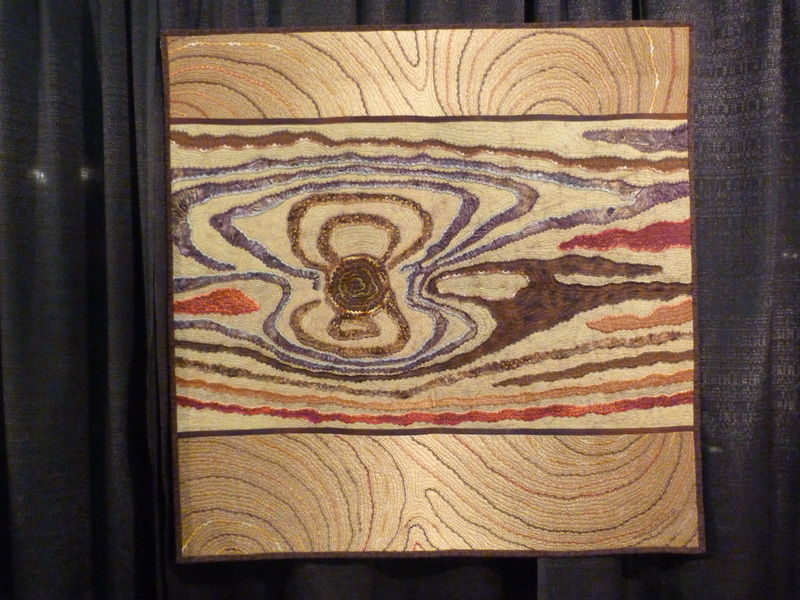 As I review the events of 2013, the year included some wonderful experiences. I love traveling to teach and sharing my quilting passion took me afield to TX, NM, CA, OR and South Africa. Quilters all over the world are such welcoming and kind people. 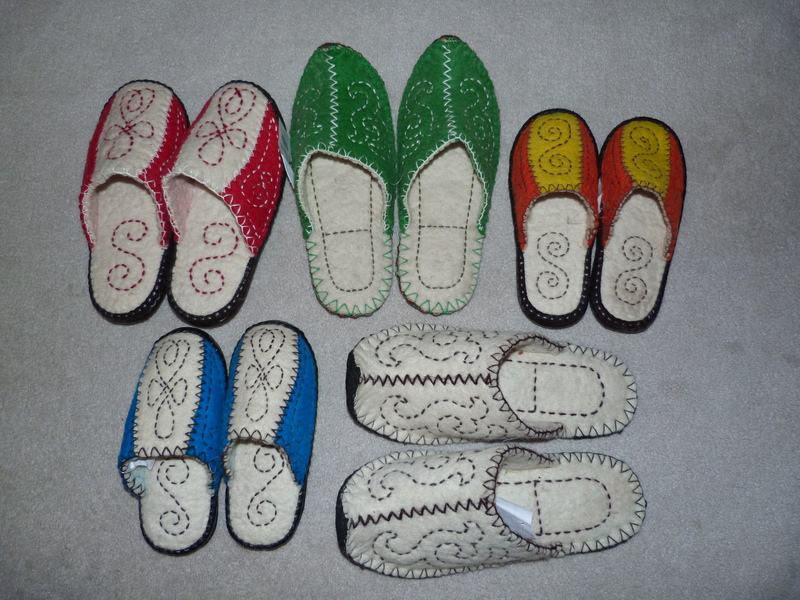 Next year’s plans already include TX, PA, CA, CO and Mongolia. 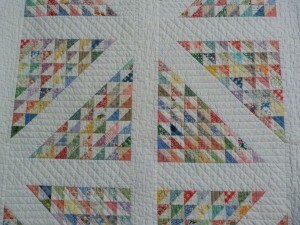 On the home front, I’m expecting my first grandchild in late June so there is much excitement! Do you make New Year’s resolutions? The start of another year gives us a good incentive to think about our goals large and small. 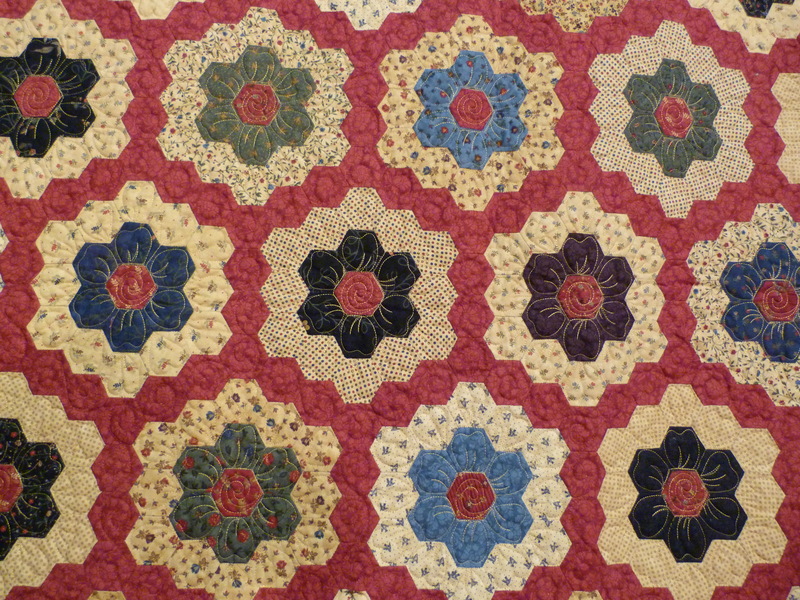 One of my resolutions is to spend time quilting every day when I’m at home. Hours are easily swallowed up with administrative tasks ranging from negotiating teaching contracts and making travel arrangements to handling my business accounting. Not to mention writing blogs and newsletters and succumbing to computer distractions. It’s a matter of discipline and I need to deliberately apportion my time each day to include time for quilting and designing quilts as well as making sure I complete all the essential business tasks. 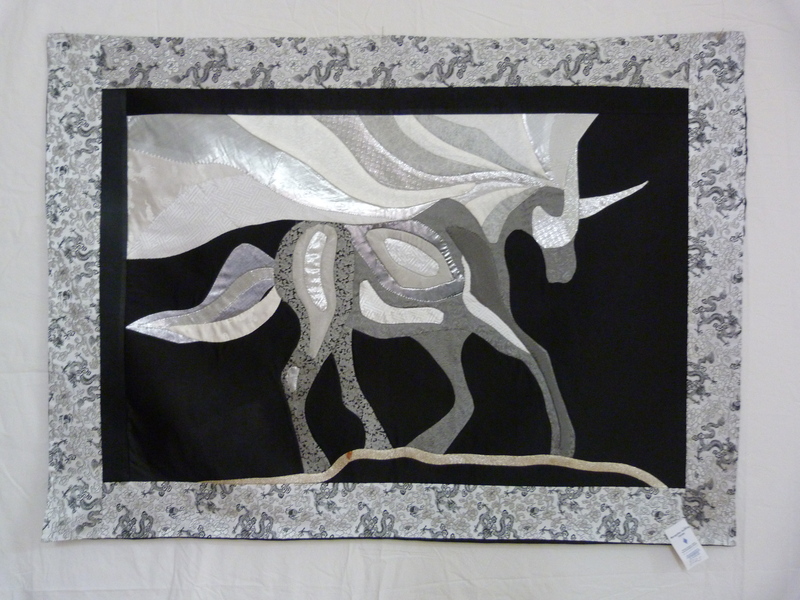 The intention is there, let’s see how I do…..
May you have a happy and productive 2014! The house is decorated and festive, the Christmas cards posted, the presents are wrapped and the first two batches of mince pies have already been consumed! 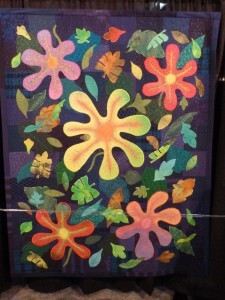 I love this time of year with family and friends, good food, a joyous celebration at church and much singing. 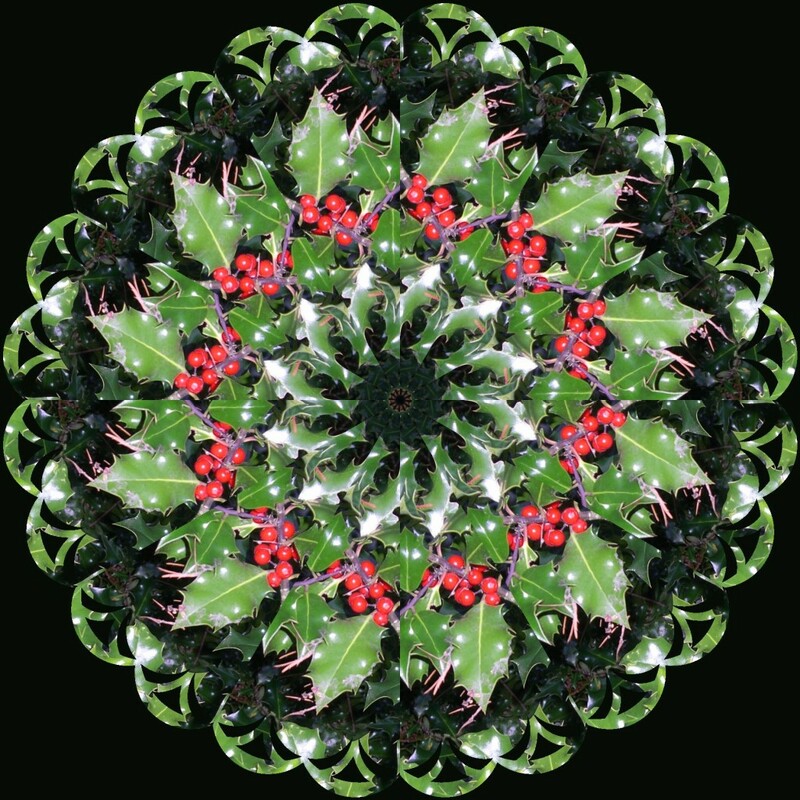 I hope your holidays are happy and stress free and that you’ll find some quiet peaceful moments when you can reflect on the joys of life itself. 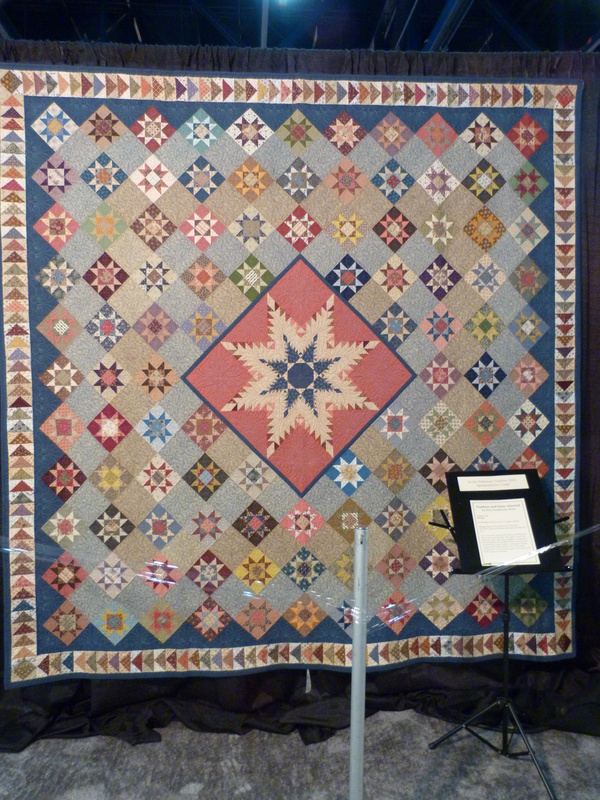 A special exhibit I particularly enjoyed, was In the American Tradition. This is an annual exhibit which seeks to honor the country’s rich quiltmaking heritage. 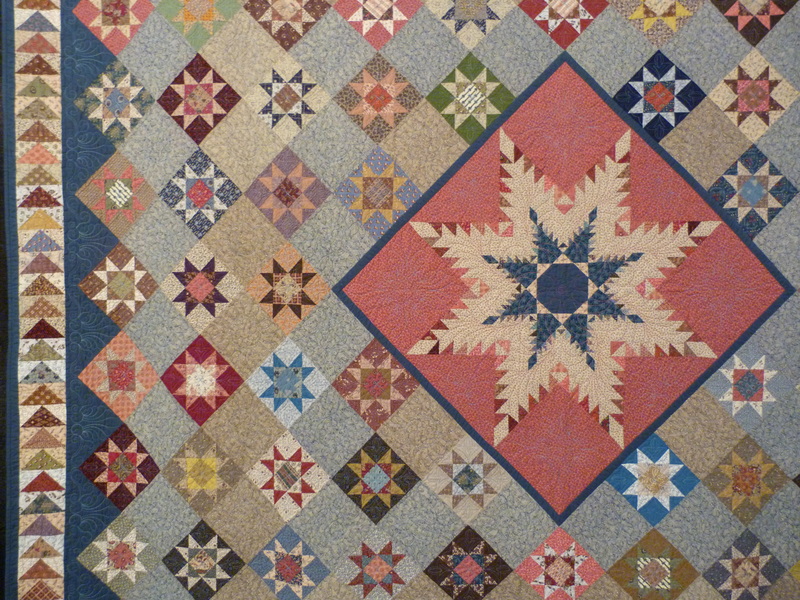 All the quilts displayed are clearly based on a documented 20th century or earlier American design or pattern. These wonderful traditional patterns have stood the test of time and are still absolutely beautiful. 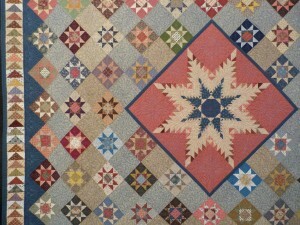 I find myself returning to them again and again, especially the star patterns. 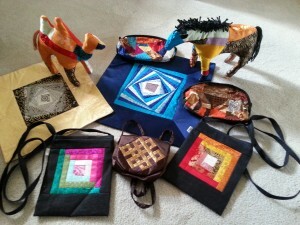 Here’s a selection. 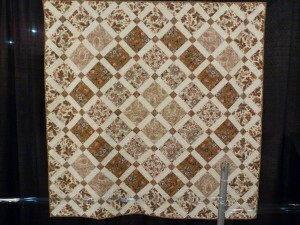 A gorgeous Lone Star, Texas Gold by Vickie Owen from Texas,was made using a pattern reproduced from an antique quilt in an old quilt magazine. 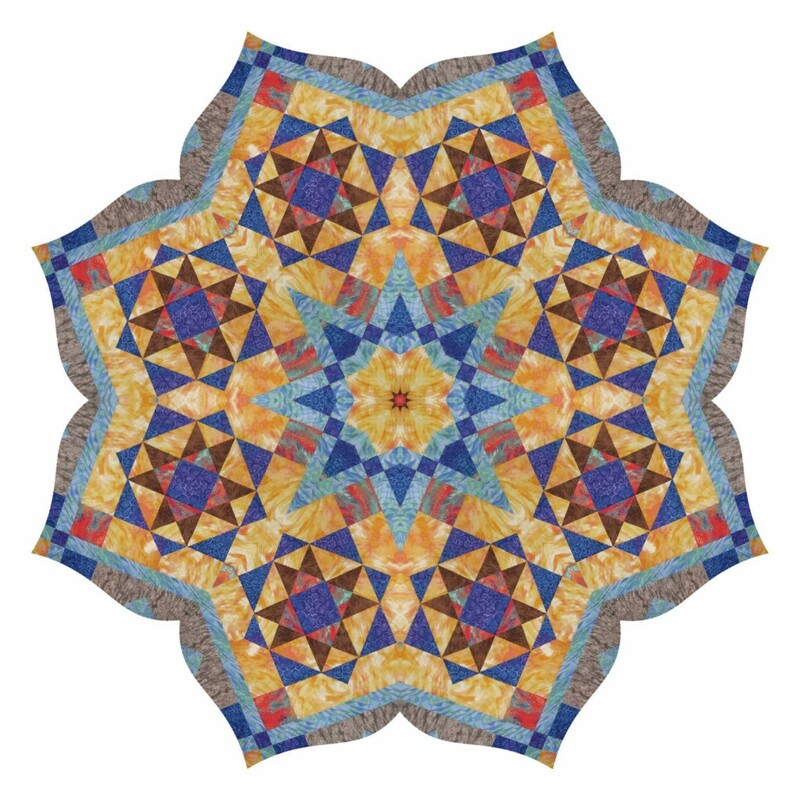 The navy and black in combination with the cheddar orange makes this star striking. Feathers and Stars Abound by Zvia Strahilevitz-Klein from Israel is lovely combination of stars in such pretty soft colors. 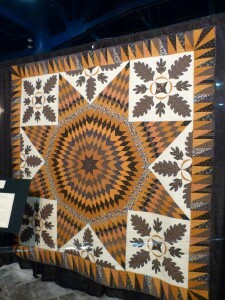 Her design source was Judy Rothermel’s Ohio Star Medallion quilt and Marsha McCloskey’s Feathered Stars. 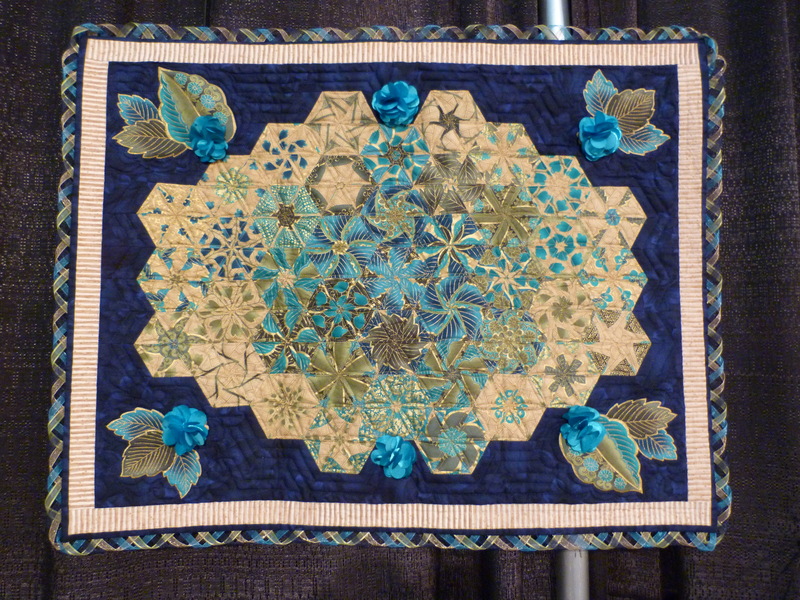 She resized the blocks and center Feathered Star to fit into this medallion. Last Summer’s Leftovers is a beautiful hand-quilted scrappy quilt made by Rahna Summerlin from Florida. 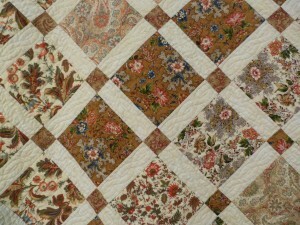 The design source is a Railroad Crossing quilt in Sharon Newman’s Treasures from Yesteryear Book 2. 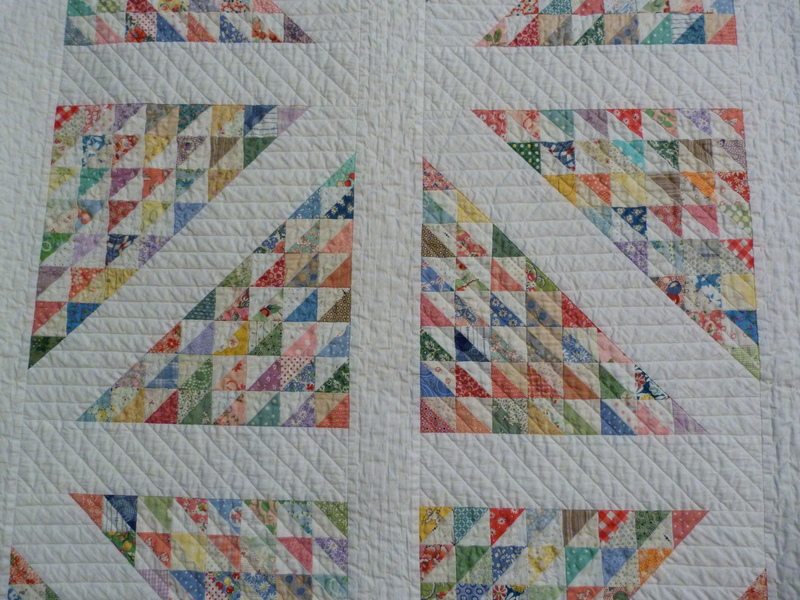 Rahna writes, “I am constantly inspired by antique quilts and am infatuated with scrap quilts from the early mid 1900’s.” This quilt was made with leftover triangles from a prior project. 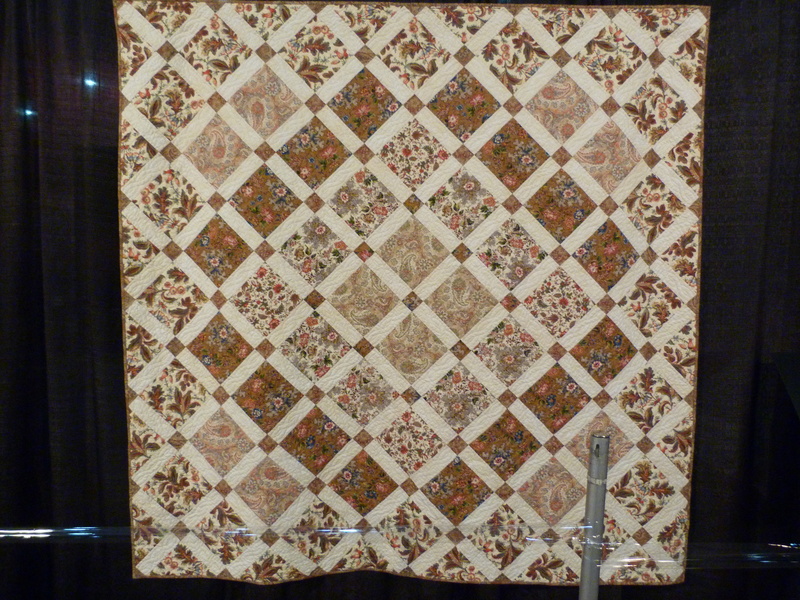 Grandmother Eulah’s Flower Garden was hand pieced by Nancy Davis-Altman from Washington and machine quilted by Lin Clark. 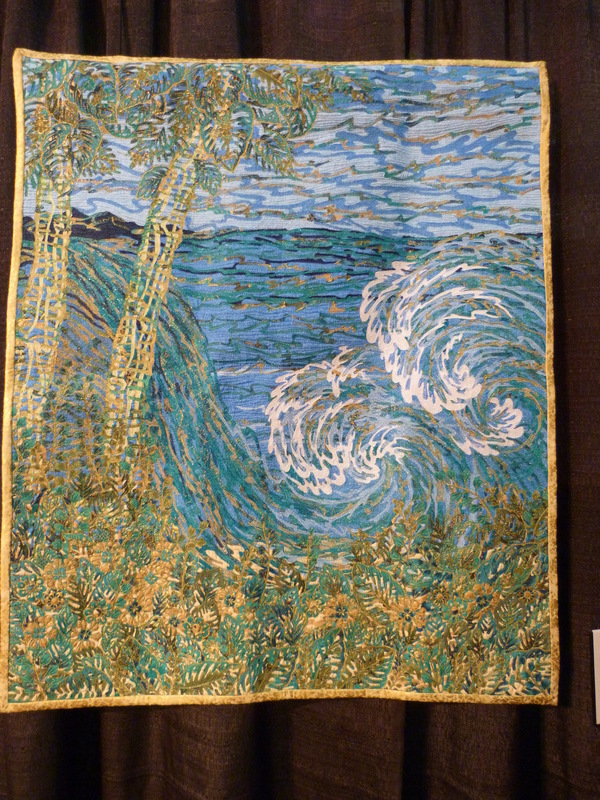 Nancy’s grandmother, Eulah Davis was her inspiration. 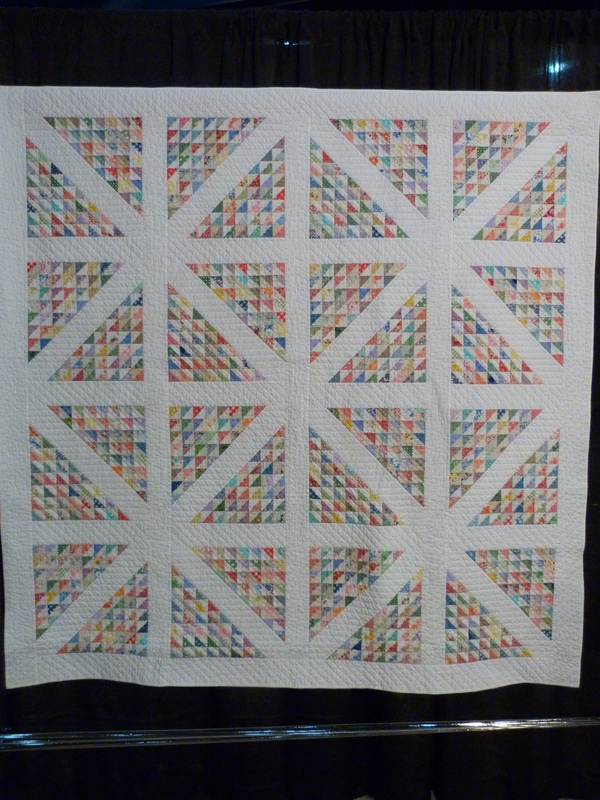 She gave Nancy a quilt for a wedding present and it was always a favorite. Nancy’s grandfather used to call Eulah his “Little Petunia”, so the Grandmothers Flower Garden seemed a fitting pattern for this quilt made to honor her. 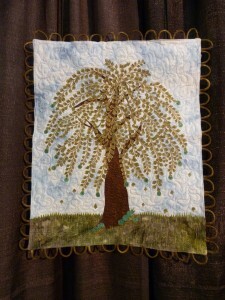 Connecticut comes to Spring made by Minay Sirois of Spring, Texas is amazing in its simplicity and beauty. 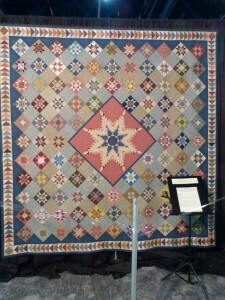 The design source is Chinz One Patch (c1820-1840) made by the Hollister Family of Washington, Connecticut. 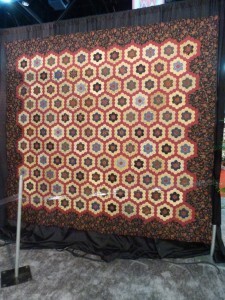 Minay saw a picture of this quilt in the book Quilts and Quiltmakers: Covering Connecticut. 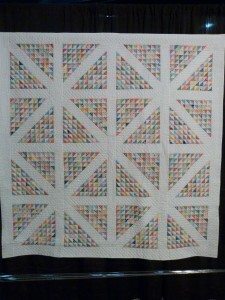 What makes this simple one-patch quilt with sashing so stunning is the fabric choices. 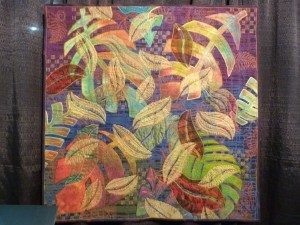 It took Minay seven years to find just the right fabrics to recreate the effect. 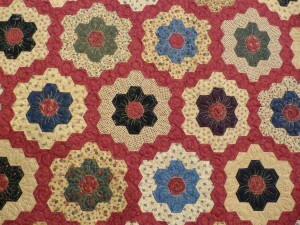 It is very successful and an absolutely gorgeous hand quilted quilt. Over the years I’ve admired the work of Libby Lehman and was excited when she visited my local quilt guild to lecture and teach a workshop a few years ago. Libby is known for her exuberant colorful quilts and her brilliant use of thread in a playful way that adds an additional dimension to her work. She has traveled all over the world inspiring quilters with her creativity and good humor. 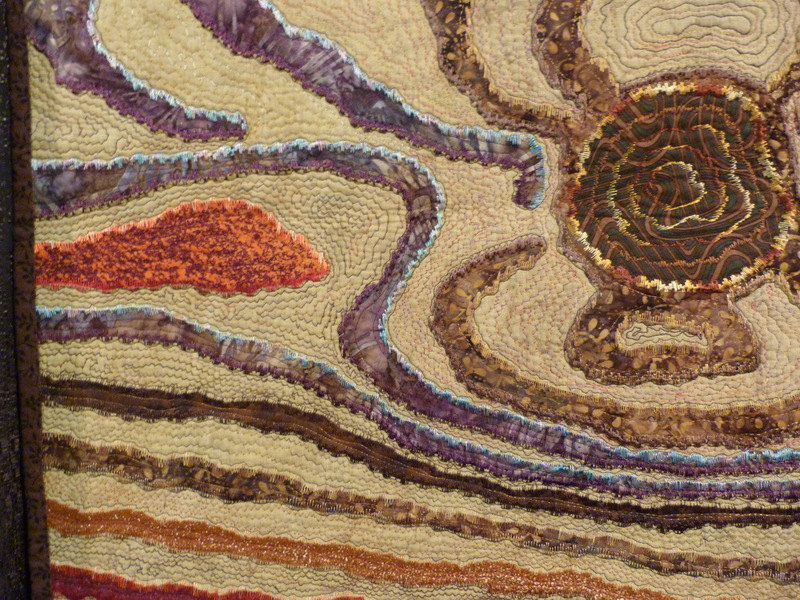 Unfortunately, Libby suffered an aneurysm about six months ago which burst in her brain. 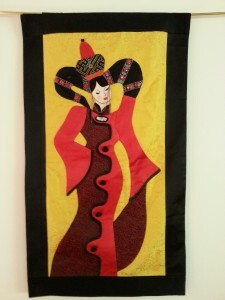 She had two major surgeries followed by a stroke and is now residing in a senior retirement center. 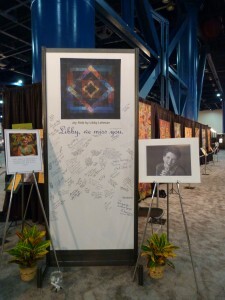 Her contribution to the quilting world was honored in a special exhibit. 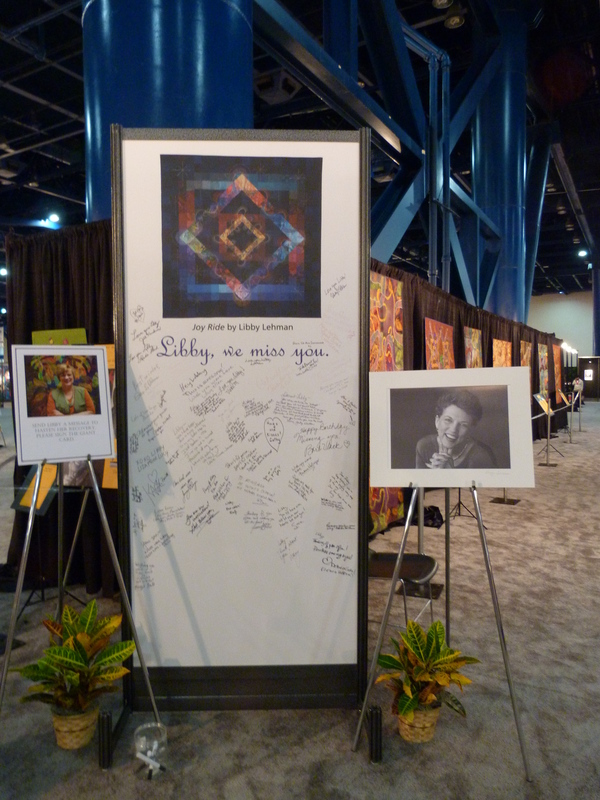 Here’s a large white board, a We Miss You sign, where quilt show attendees could write messages for Libby and send their get well wishes. 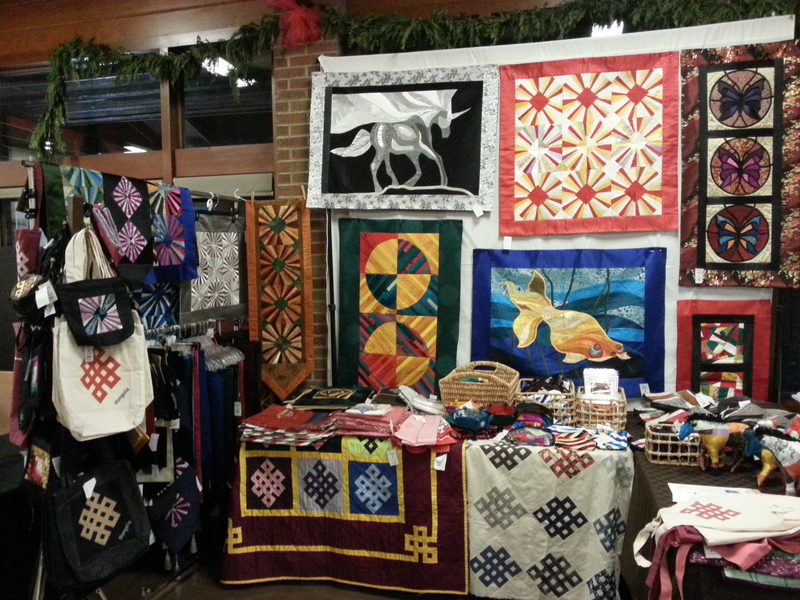 The quilt on the right is one of Libby’s well-known pieces made in 1994, Tidewaters. 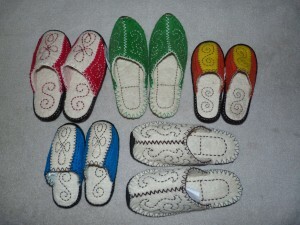 Below are examples of her recent work from 2012. Watch Your Step V: Back Porch – full and detailed shots. 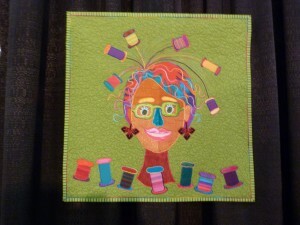 Here’s Libby’s humorous self-portrait, also from 2012. 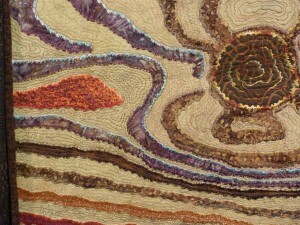 To see more examples of Libby’s work, check out her website. 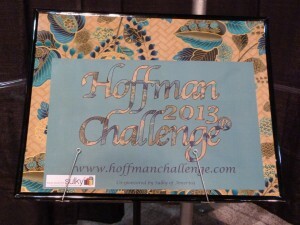 Every year Hoffman Fabrics organizes a challenge with a theme fabric. 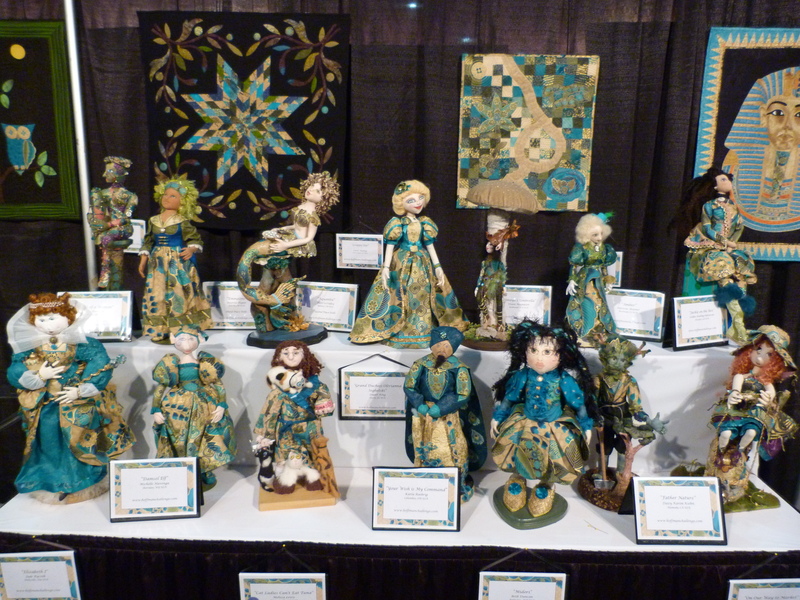 Contestants make small quilts or dolls using the fabric in any way they like as long as it is recognizable. 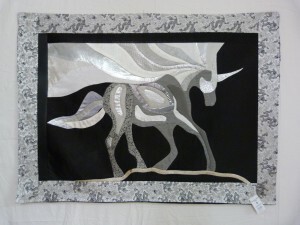 It’s always fun to see the creativity and the different ways people are inspired by the theme fabric. 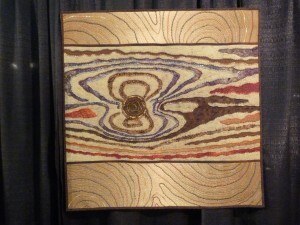 The fabric is shown on the edge of the sign. 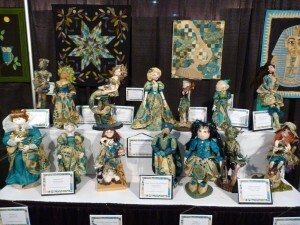 Here’s the doll collection too. I love the variety of interpretations as shown by the examples below. The Hoffman Challenge exhibit travels extensively and you can make arrangements with Hoffman to display their quilts at your local quilt show. 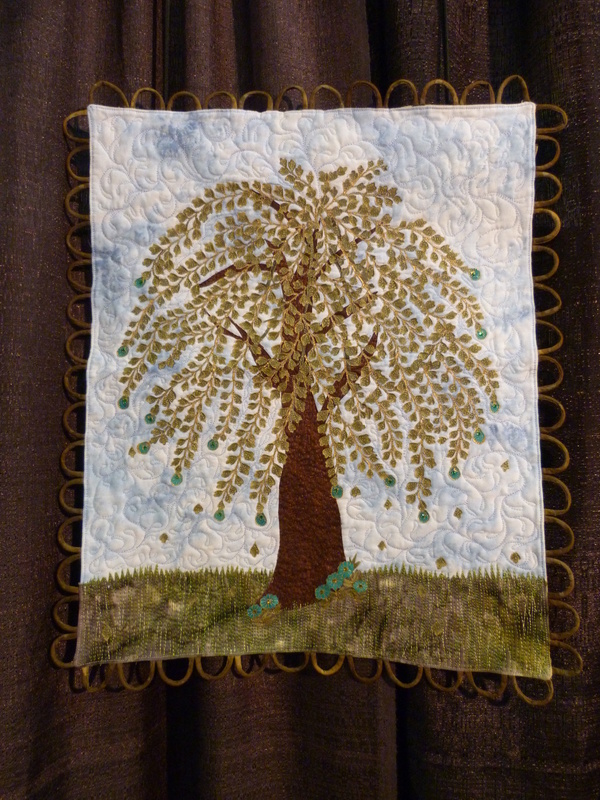 Willow II by Gayle Shelton, TX is a beautiful tree nicely set with loops around the outer edge of the quilt. 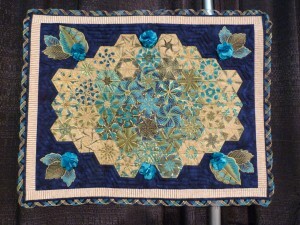 Hexifun by Shirlee Carter, FL is a mini One-block Wonder – such pretty hexagons created from the theme fabric and the attractive addition of ribbon around the edges. 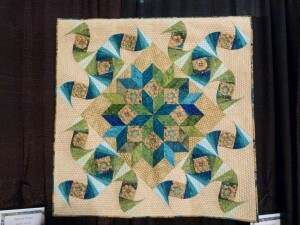 Paradise Cove by Benita Goodheart, OR, was awarded Best First Time Entry Applique. 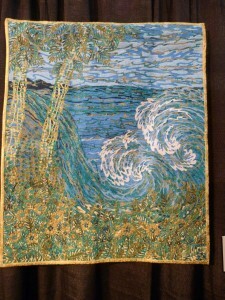 It reminds of a Vincent van Gogh impressionistic painting. The King and I by Anna Macaluso, NJ won First Place Mixed. 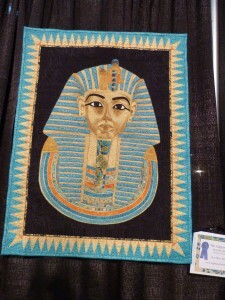 The king’s face was beautifully shaded and quilted creating great perspective. It was stunning. 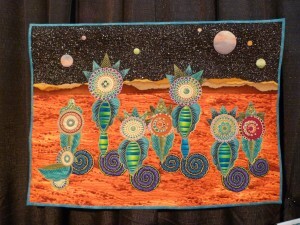 The Roswells from the Planet Quiltron by Alice Zimmerman, NY, made me laugh. 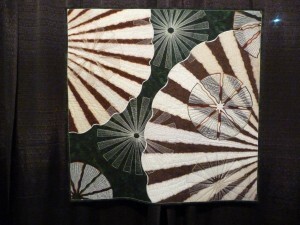 It was such a different take on the fabric and pure fun. Ribbon Candy by Cyndi McChesney, CO was beautifully executed. 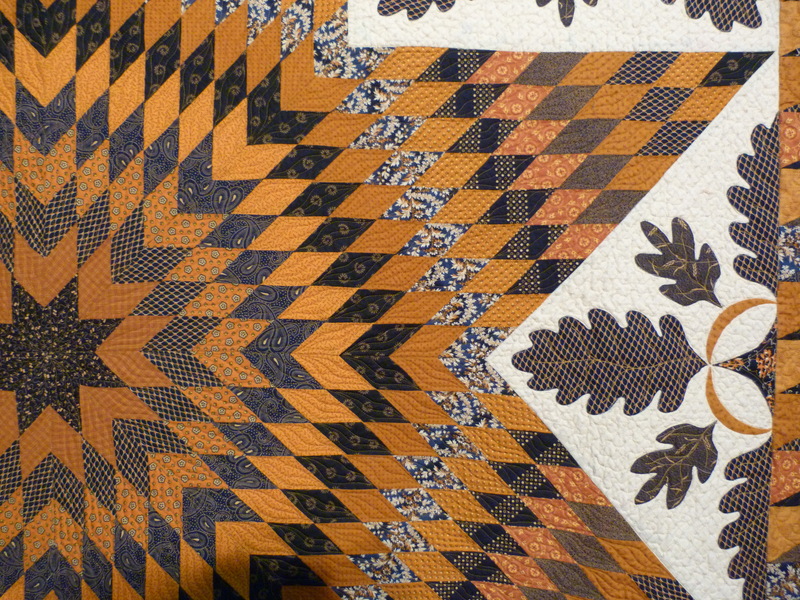 Cyndi’s color gradations in the Twisted Log Cabin blocks give the quilt depth and a wonderful three dimensional quality.